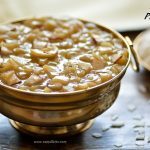 Basundi Recipe / How To Make Basundi, with step by step pics and a short YouTube video. 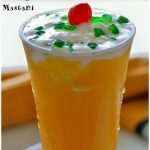 It is an Indian dessert famous in the western states of India like Maharashtra, Gujarat etc. 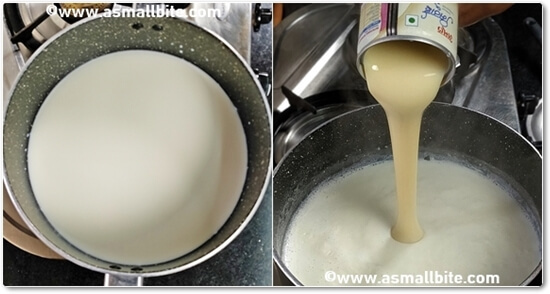 It is done by simmering the milk for hours but I have shared a quick method using condensed milk and the total process gets finished within 30 minutes. 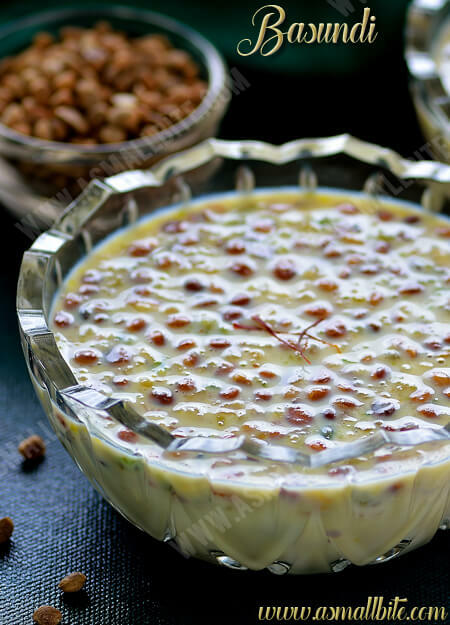 I suggest using chironji / charoli nuts which lends a traditional taste to the dessert. 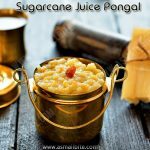 Also, it can be prepared during Ganesh Chaturthi, Navratri as a prasad ……. 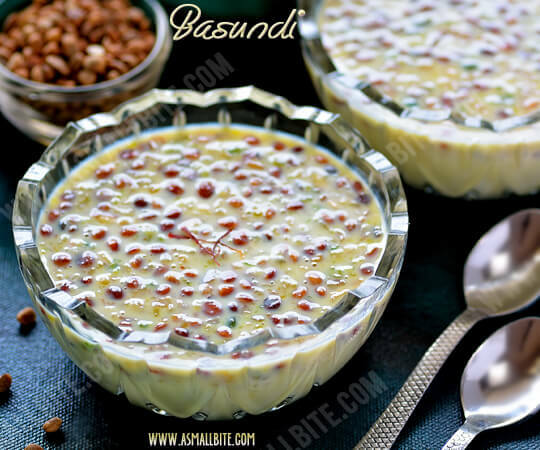 I have shared this post on how to make Basundi recipe, with step by step pics. 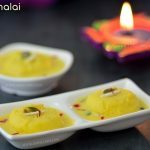 This Indian dessert is famous in the western states of India like Maharashtra, Gujarat etc. Soak saffron strands in little warm milk. Then break or chop cashews, pistachios and almonds into small pieces. In a heavy bottomed pan, pour the milk and boil for about 10 minutes in low flame. Don't forget to stir in the middle, otherwise, it gets burnt at the bottom and smells bad. By the time, the milk reduces in volume and now pour the condensed milk. Boil for another 5 minutes, scrape the sides and add the scrapped milk solids to the milk again. Then add crushed cardamoms. Now add the mixed nuts and saffron to the boiling milk. After adding saffron, there will be a change in the colour slightly, but don't add saffron strands more. Finally, add charoli nuts and switch off the flame. It should be in the flowing consistency only, not too thick. 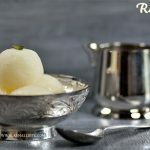 Enjoy this Basundi Recipe chilled or warm. Use full-fat milk to get a rich taste. Condensed milk can be replaced with 1/4 cup of sugar. But condensed milk quickens the process and lends more taste. Furthermore, always use a heavy bottomed 0r non - stick pan. Also stir every now and then to avoid burning at the bottom. Do the whole procedure in low flame only otherwise the milk gets burnt and smells bad. After that, you cannot troubleshoot it. If preferred 2 generous pinches of nutmeg powder can be added for more flavour. 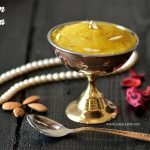 Don't add saffron more than mentioned, it should not overpower the basundi recipe, just mild only. If added more, it will turn the colour to full yellow. I suggest you use charoli / chironji nuts, which lends the traditional taste and flavour. It thickens with time, so add little warm or chilled milk to adjust the consistency. Always prepare before 2 hours prior to serving, so the flavours get infused well. The shelf life of this basundi is 2 days under refrigeration. 1. Soak saffron strands in little warm milk. Then break or chop cashews, pistachios and almonds into small pieces. 2. In a heavy bottomed pan, pour the milk and boil for about 10 minutes in low flame. Don’t forget to stir in the middle, otherwise, it gets burnt at the bottom and smells bad. By the time, the milk reduces in volume and now pour the condensed milk. 3. Boil for another 5 minutes, scrape the sides and add the scrapped milk solids to the milk again. Then add crushed cardamoms. 4. Now add the mixed nuts and saffron to the boiling milk. After adding saffron, there will be a change in the colour slightly, but don’t add saffron strands more. 5. Finally, add charoli nuts and switch off the flame. It should be in the flowing consistency only, not too thick.